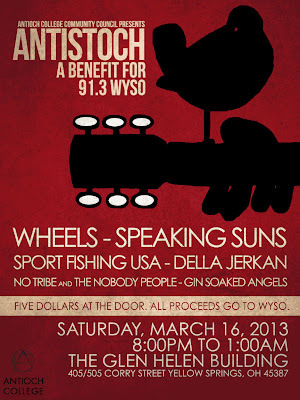 Antioch College’s Community Council will host Antistoch: a benefit concert for WYSO on March 16, in the Glen Building, 405/505 Corry Street, Yellow Springs. Held in honor of the public radio station’s 55th anniversary, Antistoch will feature performances by balladeer Della Jerkan, the Gin Soaked Angels quartet, untried No Tribe and the Nobody People, sonic texturizers Speaking Suns, pop rock ‘n’ rollers Sport Fishing U.S.A., and an acoustic iteration of local heroes Wheels. Performances begin at 8:00 p.m. Admission is $5 at the door. 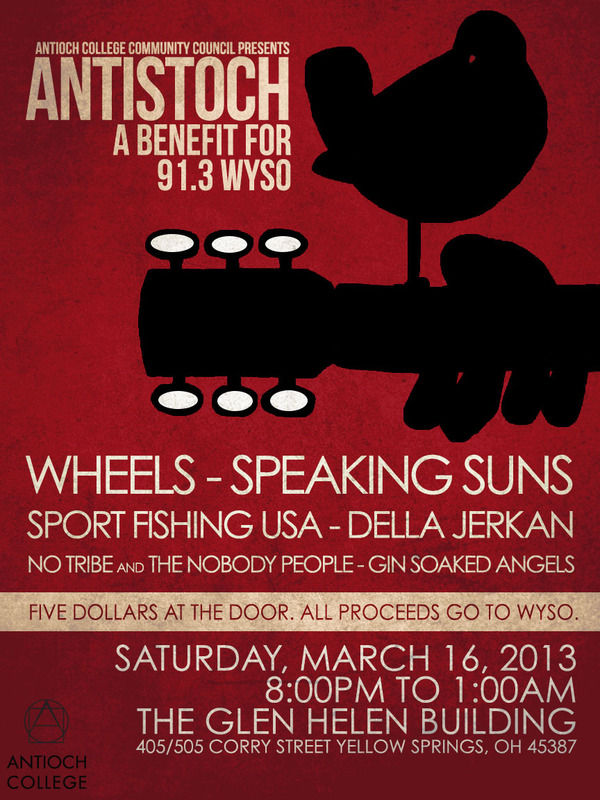 All proceeds go to WYSO. WYSO operates at 50,000 watts in the Charles Kettering Building at 150 E. South College Street. Antioch College and Antioch University announced in December that the boards of both institutions had agreed to a plan that would transfer ownership of the non-commercial FM radio station WYSO to the College. The terms of the agreement are subject to certain regulatory and court approvals. The College and the University have agreed to promptly obtain all necessary approvals and to close the transactions. Governance plays a vital educational role at Antioch College. As a “laboratory for democracy,” Antioch seeks to provide students with an unusually holistic and rewarding learning experience through participation in shared governance and responsibility for community life. Students, faculty and staff are elected to Community Council. For information, call Eric Rhodes, Antioch College Community Council president, at 330-780-9695 or comcil@antiochcollege.org.